Circle June 12 in your calendars, fans of Angry Birds! Angry Birds Epic, Rovio's freemium turn-based RPG that soft-launched roughly two months ago, will officially land on iOS and Android devices this Thursday. It's the developer's second game that drastically strays away from the concept behind the original Angry Birds title. Unlike Angry Birds Go!, which is a full-fledged racing game, Angry Birds Epic is a turn-based RPG, which revolves around the never-ending feud between the stealing swines and the vengeful birds. The story behind Angry Birds Epic is pretty similar to the plot of other titles of the franchise – the green piggies have stolen the unhatched offspring of the birdies once again. Of course, this means war, so it comes to no surprise that the feathery critters stand up to the bad pigs in order to regain their stolen eggs. In Angry Birds Epic, players take control of some of the most popular characters from Rovio's series, such as Red, Chuck, Bomb, and all of them have unique abilities and attacks. One of the more interesting aspects of the game is its setting – yes, it's cartoony, but unlike previous installments of the series, Angry Birds Epic is set in a fantasy world. The militaristic avians fight against the pigs with swords, defend themselves with wooden bucklers, and cast magic spells. 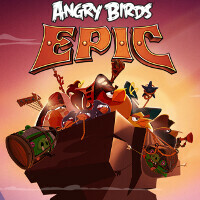 All in all, Angry Birds Epic seems like a much-needed refreshment for Rovio's successful series. Only time will show if this turn-based RPG will rekindle the dwindling popularity of Angry Birds. Is this game will come to Windows phone? Just let the franchise die already... Please! u can buy Rovio and do it!